The gif on this page shows more clearly there is a link between the crater and the mountain. But which came first the crater or the mountain? Is that a Pingo on Ceres? They beat me by 4 days. Had to go look up what a "pingo" is. The conical mountain could be something like one. It does look like a lump of ice that has floated up through the surface. I thought I saw at least one crater whose exposed walls on the inside looked like the same crystalline material. Question: is Ceres one the asteroids that has been observed to sport a comet-type tail? It is hard for me to visualize how ice would be under this dirt, but I believe it is, it is just that I don't understand why it does not flow upwards more through the dirt. The experiments, performed using the Vertical Gun Range at NASA's Ames Research Center, suggest that when asteroids and other impactors hit Ceres, much of the impact material remains on the surface instead of bouncing off into space. 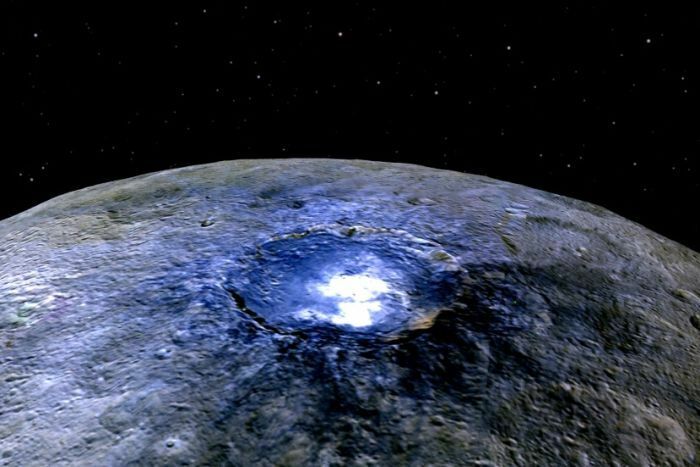 The findings suggest the surface of Ceres could consist largely of a mish-mash of meteoritic material collected over billions of years of bombardment. All of this, and then there is the possibility that Ceres is full of Ammonia down deep, that is, if it was formed in the outer solar system. (Some item of speculation lately). For me this indicates that Ceres should be upgraded as a target, of intentions. I see that the object perhaps contains a broad distribution of chemicals desired, on it's surface. Yet it has a small gravity. It has Magnesium available for rockets (Although lots of things will do for such a weak gravity well). I don't intend to go into terraforming here (Wrong section), but will mention that I am thinking reverse dyson sphere. Not a pressurized shell, but rather a very large amount of orbiting discrete objects, so that many times the disc of Ceres can be recovered for solar energy, and so that the solar wind is blocked (And harnessed), and of course radiation shielding, and then in each discrete orbiting object the potential for a synthetic gravity machine. Along with booster recovery just demonstrated recently and perhaps the notion of some nuclear (Fission/Fusion) propulsion, I really wonder if Ceres could be a good bet for cultivating a child culture for human kind/type. You will read it if you want to, so I won't make quotes. Some thinking has it that Ceres may have had an outer solar system birth. So that's an interesting thought. I am sure that because of it's current location it has shed about all of it's lighter overburden such as Nitrogen, but I am hoping that some objects of it's size, or smaller may bear some resemblance to it. It is estimated that 200 Dwarf Planets may exist in the Kuiper Belt, and perhaps 10,000 in the Oort Cloud. I do not care for the characteristics of Pluto, too much overburden of light ices. So, I am thinking that smaller Dwarf Planets may prove to offer more by having a reduced amount of such overburden. But they would have to have cast it off by their original heat, or by impacts, or perhaps in the case of the smaller objects, the solar wind can still strip them relatively clean of such lighter ices, even way out there. 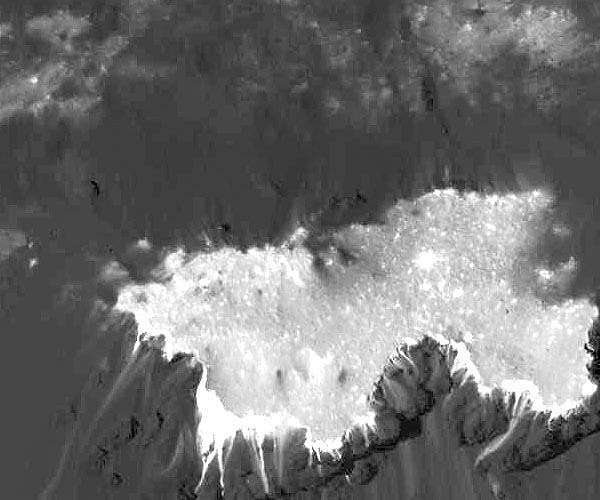 Dawn's latest orbit reveals dramatic new views of Occator crater as it reached its lowest-ever and final orbit around dwarf planet Ceres on June 6 and has been returning thousands of stunning images and other data. The flight team maneuvered the spacecraft into an orbit that dives 22 miles (35 kilometers) above the surface after taking three years of orbiting Ceres, Dawn's lowest altitude before this month was 240 miles (385 kilometers), so the data from this current orbit bring the dwarf planet into much sharper focus. Dawn's visible and infrared mapping spectrometer had previously found the bright deposits to be made of sodium carbonate, a material commonly found in evaporite deposits on Earth. 2005 we started to talk about what we were going to do and explore witha probe that would use ion drive to make the journey possible. Sun sets on NASA’s Dawn spacecraft after 11 years of studying asteroid belt and a journey of 4.3 billion miles, the craft has run out of fuel and has now gone silent. Without the hydrazine fuel that the craft uses, it is no longer able to turn its solar panels toward the Sun to recharge or to keep its antennae pointed toward Earth, which means it can no longer send data back to mission control. Something that would have made the Dawn mission continue would have been the ability to refuel via insitu resources. Landing and then hopping to the next planetoid to continue the exploration of the many asteroids that we can visit. Identifying renewable sources of spacecraft fuel has become increasingly important as NASA prepares to send humans to Mars and Earth's finite supply of minerals keeps shrinking.